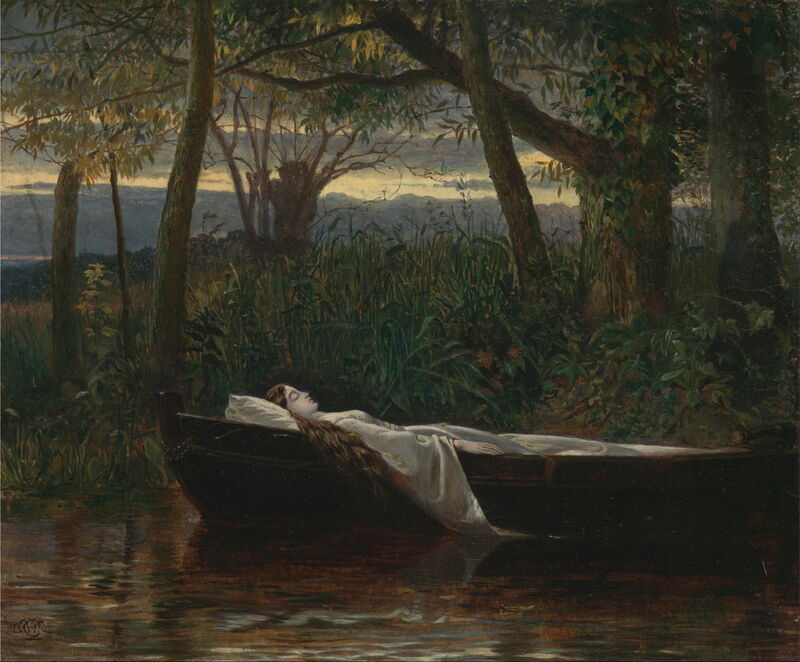 Elaine of Astolat, or the Lady of Shalott? Paintings based on Arthurian legends became popular themes in the nineteenth century, particular for British artists who were associated with the Pre-Raphaelite movement. Just like classical mythology, there is no common source or agreed narrative for these legends. Although painters tended to rely on the more established literary sources of the day, they often proved as contradictory as much older accounts. In Arthurian legend, there is a common thread which tells of a woman who falls in love with Sir Lancelot. Her love is unrequited, and she dies, her body travelling by river to King Arthur’s castle at Camelot. To many today, this is the essence of the story of the Lady of Shalott, as told in two versions of Alfred, Lord Tennyson’s poem of that name, dating from 1833 and 1842. Tennyson’s poems were in turn derived from a thirteenth century Italian novella Donna do Scalotta, rather than the better-known compilation of legends by Sir Thomas Malory published in reworked form in Le Morte d’Arthur. But between 1859 and 1885, Tennyson published Idylls of the King, a cycle of twelve further narrative poems based more on Malory. One of those poems, Lancelot and Elaine, tells a similar story quite differently: that of Elaine of Astolat. I will first summarise that story of Elaine, accompanied by paintings based on it, then the story of the Lady of Shalott. Sir Lancelot is due to take part in a tournament, at which he will appear in disguise, for reasons relating to his secret affair with Queen Guinevere. The knight seeks the help of Bernard of Astolat, who lends him armour, colours and a shield. While he is borrowing these, Bernard’s daughter Elaine falls in love with him, and begs him to wear a token of her affection at the tournament – something which he finds difficult. Elaine is entrusted with his shield until Lancelot returns. Eleanor Fortescue-Brickdale (1872-1945), Elaine of Astolat (c 1913), illustration in ‘Idylls of the King’ (1913), further details not known. Wikimedia Commons. Eleanor Fortescue-Brickdale shows Elaine of Astolat in her illustration for the 1913 edition of Idylls of the King. She sits sewing in the family castle, guarding Lancelot’s shield. Edward Reginald Frampton (1870-1923), Elaine, the Lady of Shallott (1920), oil on canvas, 63.5 × 38 cm, location not known. Wikimedia Commons. 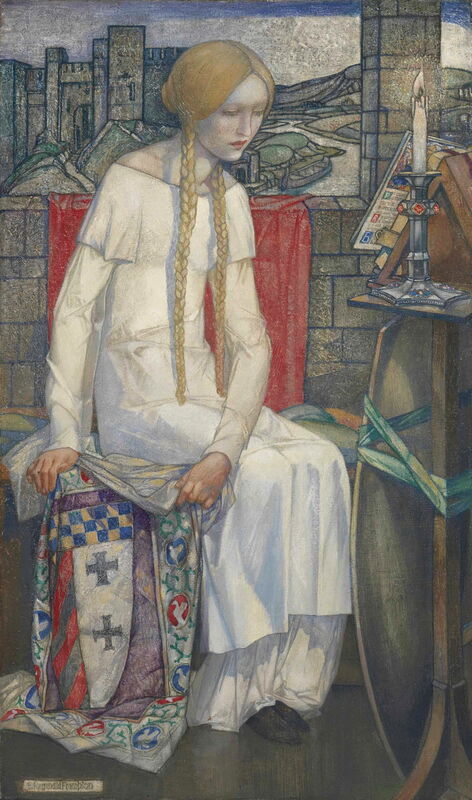 Despite its confusing title, Edward Reginald Frampton’s Elaine, the Lady of Shallott (1920) shows a similar scene, with the shield tied to a lectern. John Melhuish Strudwick (1849–1937), Elaine (1891), oil on canvas, 79 × 58.5 cm, Private collection. Wikimedia Commons. 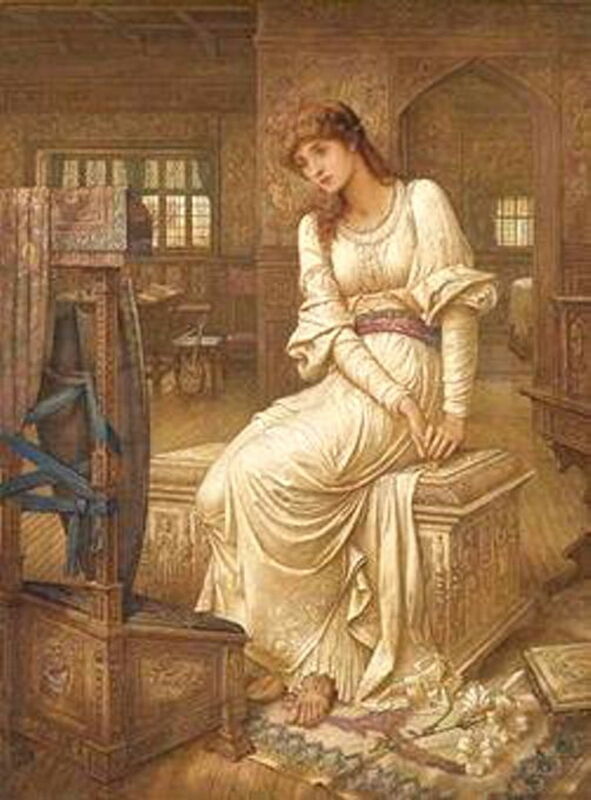 John Melhuish Strudwick’s painting of Elaine from 1891 is slightly more ambiguous: although Lancelot’s shield is shown in front of Elaine – clearly an object of some veneration – in the background to the left there is what appears to be a loom, and the shield could perhaps be interpreted as a mirror, both more evocative of the Lady of Shalott. Lancelot wins the tournament, but is slightly wounded in the process. He recuperates in Bernard’s castle, with Elaine devotedly nursing him back to health. However, she learns that her love for the knight will remain unrequited. When Lancelot departs, Elaine wishes for death, and ten days later dies of a broken heart. Elaine had made clear that on her death, she wished her body to be taken by boat to Camelot, bearing a last letter. Her wishes are followed by her father and brothers, who place her in a boat with one of their servants, who is stricken with grief at her death. Sophie Gengembre Anderson’s Elaine (1870) is shown making that final journey, her dead hands holding her last letter and lilies. As with all paintings of this phase of the story, she is dead when placed in the boat, and accompanied by a servant. 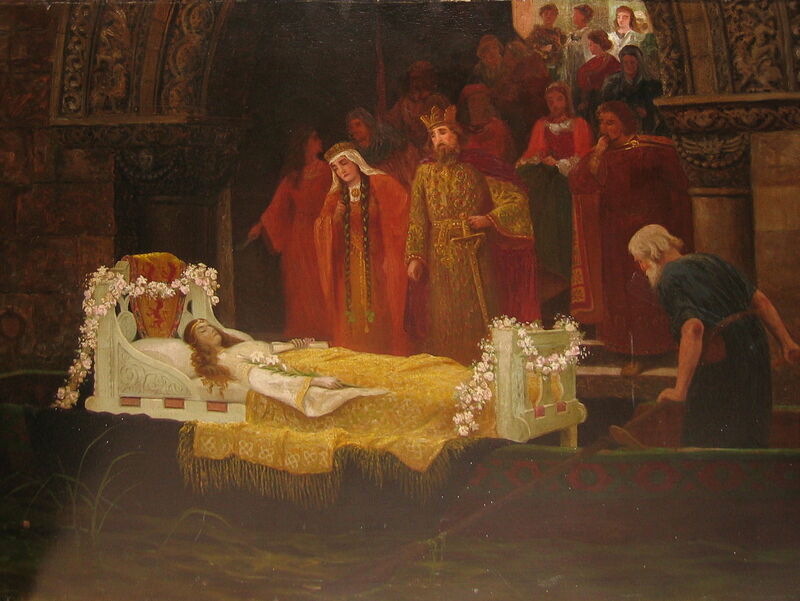 Artist not known, The Lady of Shalott reaches Camelot (before 1887), oil, dimensions and location not known. Wikimedia Commons. It is not known who painted this, The Lady of Shalott reaches Camelot (before 1887), but Elaine’s body, complete with flowers and letter, and accompanied by the servant, has now arrived at Camelot. King Arthur, Queen Guinevere, Sir Lancelot, and the rest of the court come to receive it, all weeping in sadness at the young woman’s death. 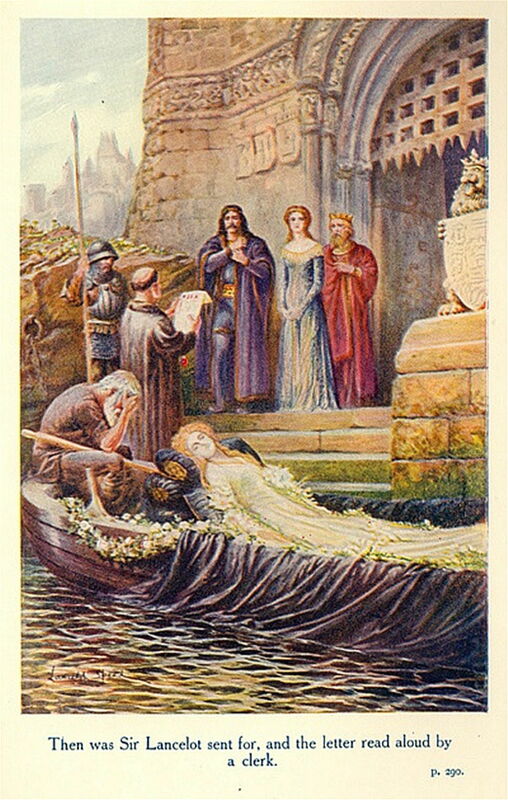 Lancelot Speed (1860-1931), Elaine in the Barge (1912), illustration in ‘The Legends of King Arthur and His Knights’, 9th edition, ed. Sir James Knowles, Frederick Warne and Co. Wikimedia Commons. Lancelot Speed’s illustration of Elaine in the Barge, for a 1912 edition of The Legends of King Arthur and His Knights, shows a more modest depiction of the same scene. After this, Tennyson has Sir Lancelot wondering whether Elaine’s love had been more true than that of Queen Guinevere, and suffering from deep remorse as a result. 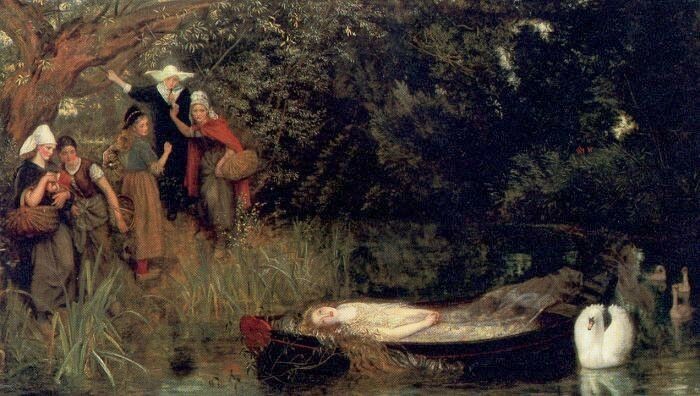 The story of the Lady of Shalott is not told in association with any related events at Camelot, and her origins are mysterious. She apparently lives in a castle which is connected with Camelot by river, and is subject to an equally mysterious curse. This confines her to weaving images on her loom, and forbids her from looking directly at the outside world. 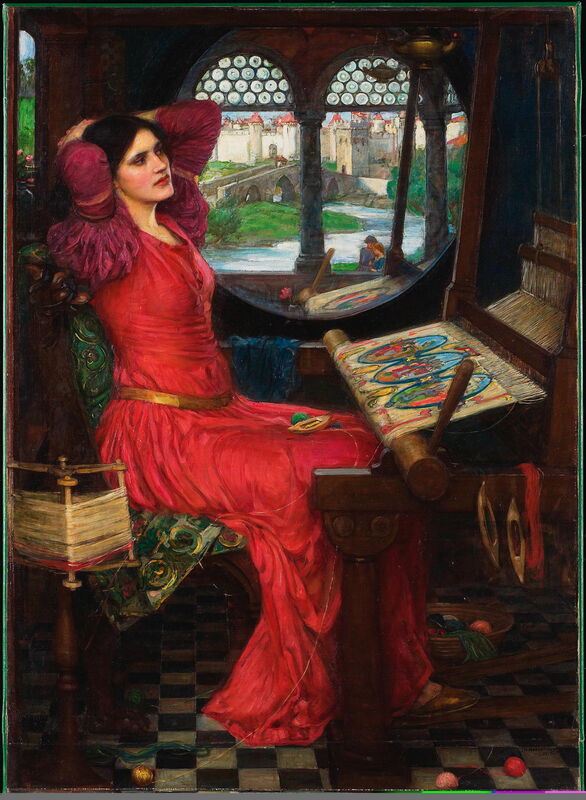 John William Waterhouse’s third and final painting of this story gets its title from Tennyson’s poem: “I am Half Sick of Shadows” said the Lady of Shalott (1915). It shows her, thoroughly world-weary at her loom, with a large mirror facing the viewer, acting as her window on the world so that she does not fall foul of the curse. 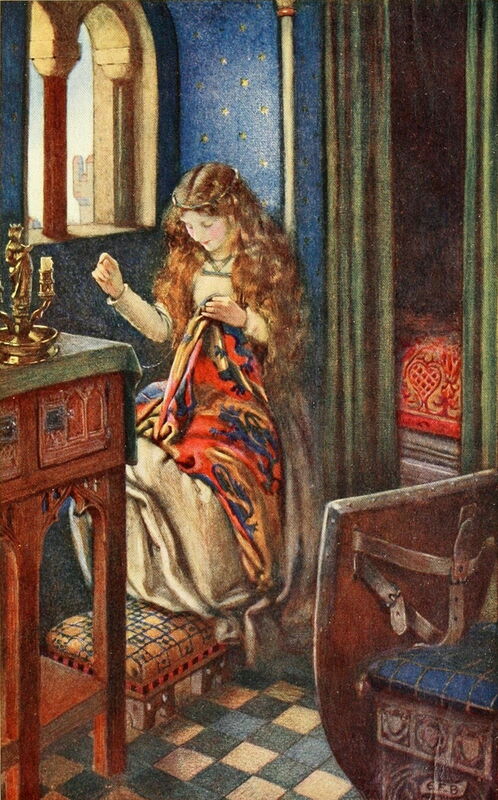 But one day, as she is sitting and weaving, the Lady of Shalott sees Sir Lancelot in her mirror. William Holman Hunt (1827–1910) & Edward Robert Hughes (1851–1914), The Lady of Shalott (1905), oil on canvas, 188.3 x 146.3 cm, Wadsworth Atheneum, Hartford, CT. Wikimedia Commons. 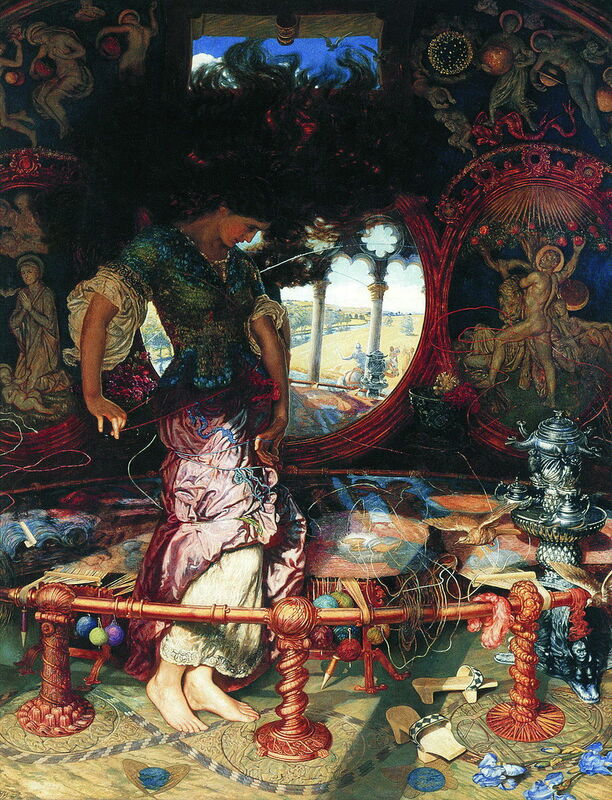 William Holman Hunt and Edward Robert Hughes’ The Lady of Shalott (1905) shows her thrown into chaos: she is so taken with the sight of the knight that she gets up and looks directly out of her window. Knotted up in the threads of her weaving, she knows that she has broken the curse, and will die. She leaves the tower in which she has been confined, and goes down to the river, where there is a boat bearing her name. 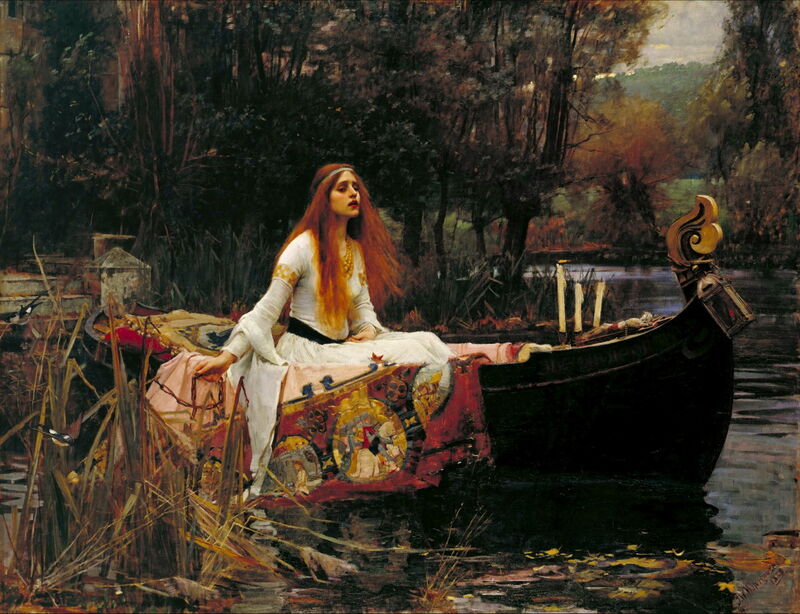 Already weakening, she gets into the boat and casts it off from the shore, as shown in John William Waterhouse’s first painting of The Lady of Shalott (1888). John Atkinson Grimshaw (1836–1893), The Lady of Shalott (c 1875), oil on canvas, 61 x 91.4 cm, Yale Center for British Art, New Haven, CT. Wikimedia Commons. 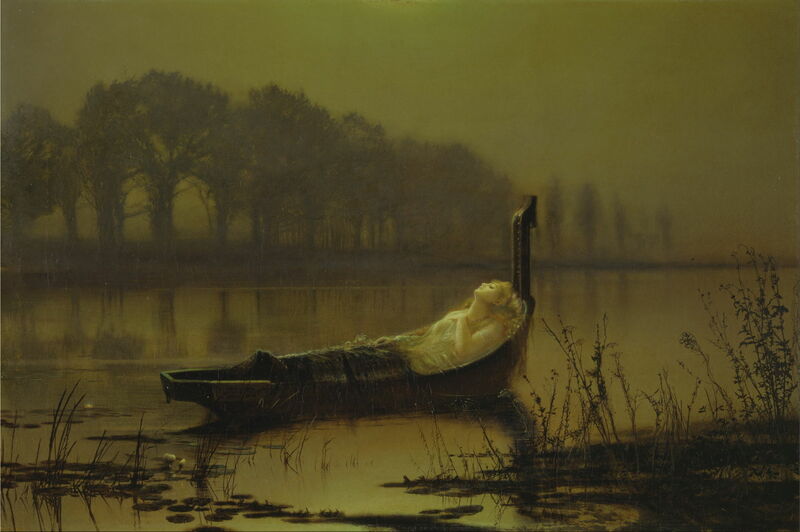 As the boat floats slowly down the river towards Camelot, she dies, as shown in John Atkinson Grimshaw’s The Lady of Shalott (c 1875, above), and the following paintings with the same title, by Walter Crane (1862) and Arthur Hughes (c 1872-73). Arthur Hughes (1832–1915), The Lady of Shalott (c 1872-1873), oil on canvas, 95.5 x 160 cm, Private collection. The Athenaeum. Although the two stories have many similarities in literary terms, they have very different implications for the visual artist. Elaine’s is a tale of unrequited love made more interesting with its Arthurian setting, and offers opportunities to explore the thoughts and desires of a young woman in love with the impossible. 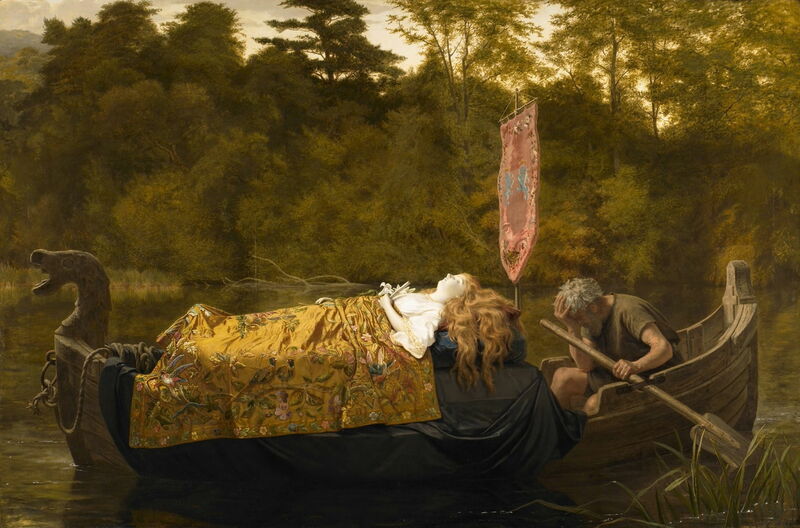 The Lady of Shalott’s story, as shown in the paintings above, is more complex, and has themes which are particularly relevant to the visual arts. These include the reality of images, seen directly or in reflection, or created by weaving, and the symbolic association of the thread of life, which was about to be broken for the Lady of Shalott. Wikipedia on the Lady of Shalott. Wikipedia on Elaine of Astolat. Posted in General, Language, Life, Painting and tagged Anderson, Arthur, Astolat, Crane, Fortescue-Brickdale, Frampton, Hughes, Hunt, legend, myth, narrative, painting, Shalott, Speed, Strudwick, Tennyson, Waterhouse. Bookmark the permalink.